Are you looking for a unique gift for your literary friends? Be sure to drop by the Library Shop of the Peninsula Friends of the Library. You’ll find it on your right as you enter the collection area of the Peninsula Center main branch. 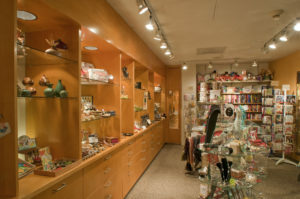 There you’ll discover gifts large and small for children and adults, including jewelry, toys, stationery, and boutique items you won’t see anywhere else. Staffed entirely by Friends volunteers, this little shop is one of the Peninsula’s best kept secrets. Be sure to tell your friends to stop by to browse and buy. All profits benefit the Peninsula Friends of the Library’s support to the District, helping to fund services such as keeping the library open on Sunday. Peninsula Friends of the Library receive a 10% discount on purchases of $10 or more! The shop is always looking for volunteers to run the cash register and stock items on the shelves. If you’re interested in helping in the shop for a couple hours, please contact Volunteer Services Coordinator Dori Medina at (310) 377-9584, ext. 276 or e-mail her at dmedina@pvld.org.